E430 comes with Windows Embedded Handheld 6.5, which is also an option for operating system in several other industrial handhelds. Windows Mobile 6.5, now known as Windows Embedded Handheld 6.5. This newer version is more users friendly and adds a bit of functionality, but largely retains the traditional Windows mobile look and feel. So on the E430 it is Windows Mobile 6.5 and for those who used earlier version of Windows mobile, things look different. Under Windows Mobile 6.5 applications are still shown as icons on one single screen that scrolls down while in this platform user interface eats up a lot of space to be more touch-friendly. Our Winmate E430 is an attractive unit with P-Cap multi touch and running the Windows Embedded Handheld 6.5 it is technologically up –to date as well. In terms of tech specs, this device is based on the Texas Instruments DM3730 processor running at 1 GHz. This OMAP chip is supported by 256MB of RAM and a micro SD card slot. For communication, these series comes with 802.11 b/n/g WiFi, Bluetooth(2.1+EDR) and built-in GPS module. Bluetooth manager is also embedded to provide a friendly and easy to use interface for managing the Bluetooth. Optional equipment includes a 3G WWAN module for data transmission as well as 1D/2D barcode reader or high frequency (13.56MHz) RFID reader. Note that it is either a barcode reader or RFID but not both. General SDK (to capture data) and Advance SDK (to setting / trigger data) will be provided by Winmate for software developers. 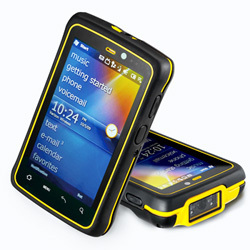 Measuring 3.2 x 5.2 inches, weighing just 232 grm, Winmate's E430T Industrial PDA is light and has a large display. As stated earlier, Winmate E430T is rugged and it can handle 5-ft drops to concrete without additional protection. It carries IP66 sealing which means it is completely seal to dust and sprays of water from all directions. Pocket-size, anti slip skin, rugged design and equipped with 1D/2D Barcode or RFID reader makes the E430T the best choice for logistic industry and warehouse.